December 2, 2009 -GE Aviation has recognized Kenya Airways for achieving the highest time on wing for a CF6-80C2 engine in Africa. The Kenya Airways' CF6-80C2 engine was installed on a Boeing 767-300ER aircraft in 2001 and has accumulated more than 35,000 flight hours and more than 6,400 cycles without a removal. Kenya Airways is the flag carrier airline of Kenya, based in Nairobi. It started operations on 4 February 1977, and operates scheduled services throughout Africa and to Europe and the Indian subcontinent, with its main base at Jomo Kenyatta International Airport, Nairobi. Moi International Airport in Mombasa serves as a focus city. As of November 2009, the Kenya Airways fleet consists of 26 aircraft and its average fleet age is 8 years. GE Aviation acknowledged Kenya Airways milestone during the GE and CFM International Pan-African Technical Conference held earlier this month in Kenya and hosted by Kenya Airways. Dr. Titus Naikuni, CEO of Kenya Airways and Allan Fulilove, Technical Director of Kenya Airways accepted the award presented by GE. Kenya Airways began operating its first CF6 engines in 1986 when the airline acquired an Airbus A310 aircraft. Today, the airline operates 12 CF6-80C2 engines along with CF34 engines and CFM56+ engines. The CF6-80C2 engine is the most popular CF6 engine model, with more than 3,700 engines in operation with more than 140 customers. The CF6-80C2 engine powers the Boeing 747, 767 and MD-11 aircraft as well as the Airbus A300 and A310 aircraft. GE developed the Tech CF6 program, which incorporates advanced technology into the high-pressure turbine (HPT), combustor and high-pressure compressor (HPC) areas. The new HPT technologies include airfoil-cooling advancements that are now standard on all new CF6-80C2 production engines. These turbine advancements improve performance retention over time, which lowers overall fuel burn and corresponding CO2 emissions. The CF6-80C2 also meets the stringent CAEP6 international regulations for emissions such as hydrocarbons, smoke, and oxides of nitrogen with margin. GE's CF6 engines have been among the most utilized and reliable in the industry. Powering more than 10 models of wide-body aircraft, the engine family has established an unparalleled record of reliability and has compiled more than 335 million flight-hours in service with more than 260 customers worldwide. Kenya Airways was established in February 1977, after the break-up of the East African Community and the consequent demise of East African Airways and was wholly owned by the Kenyan government until April 1996. In 1986, Sessional Paper Number 1 was published by Kenya's government, outlining the country's need for economic development and growth. The document stressed the government opinion that the airline would be better off if owned by private interests, thus resulting in the first attempt to privatize the airline. The government named Mr Philip Ndegwa as Chairman of the Board in 1991, with specific orders to privatize the airline. He heads a renewed company cabinet. In 1992, the Public Enterprise Reform paper was published, giving Kenya Airways priority among national companies in Kenya to be privatized. In the fiscal year 1993 to 1994, the airline produced its first profit since the start of commercialization. Also, in 1994, the International Finance Corporation (IFC), was appointed to provide assistance in the privatization process. In 1995, Kenya Airways restructured its debts and a made a master corporation agreement with KLM that bought 26% of the shares in Kenya Airways and became the largest single shareholder. In 1996, shares were floated to the public, and the airline started trading on the Nairobi Stock Exchange. In October 2004, the company cross-listed its shares at the Dar-es-Salaam Stock Exchange. In April 2004, the company re-introduced Kenya Airways Cargo as a brand and in July 2004, the company's domestic subsidiary Flamingo Airlines was re-absorbed. In 2005, Kenya Airways changed its livery. The four stripes running the length of the fuselage were replaced by the slogan "Pride of Africa". The KA tail logo was replaced by a styled "K" encircled with a "Q" to evoke the "KQ" call letters for the airline. In the 6 months ending 30 September 2005, profits after tax rose 48% vs 2004-5 to Kshs 2.231 Billion (US$30 Million) and over 1.2 million passengers were carried. In the 6 months ending 30 September 2004, profit after tax was $19.5 million, compared to $4.5 million for the same period the previous year. This has been attributed to KTAP (Kenya Airways TurnAround Project) overhauling the airline's revenue management, cost structures and route and fleet planning. In the full-year results ending 31 March 2005, profits after tax almost tripled over 2003-4 to Kshs 3.882 Billion (US$50 Million) and over 2 million passengers were carried. Kenya Airways announced record profit growth for 2005-06. After-tax profits increased from 3.88 billion Kenya shillings (about $54 million USD) to 4.83 billion shillings. 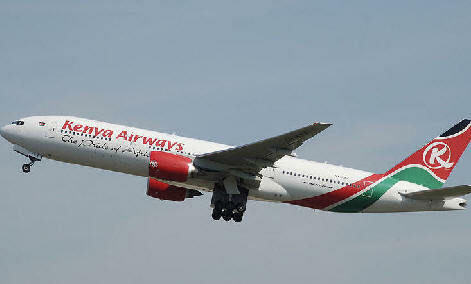 In March 2006, Kenya Airways won the 'African Airline of the Year' Award for 2005, for the fifth time in seven years. Passenger numbers in the fiscal year 2006 (April 2006 ? March 2007) were a record 2.6 million. On September 4, 2007, SkyTeam, the second-largest airline alliance in the world, welcomed Kenya Airways as one of the first official SkyTeam Associate Airlines. The airline is owned by individual Kenyan shareholders (30.94%), KLM (now Air France-KLM) (26%), Kenyan government (23%), Kenyan institutional investors (14.2%), foreign institutional investors (4.47%) and individual foreign investors (1.39%). It has 2,408 employees (at March 2007). Kenya Airways also owns 49% of Precision Air in Tanzania.